Stunning and lifelike PVC and PE greenery accented by gorgeous scarlet hydrangea blossoms, along with textured red and golden balls give a subtle sheen to this timeless garland. Features our exclusive Nun-Chuck battery and Super Mini lighting system. 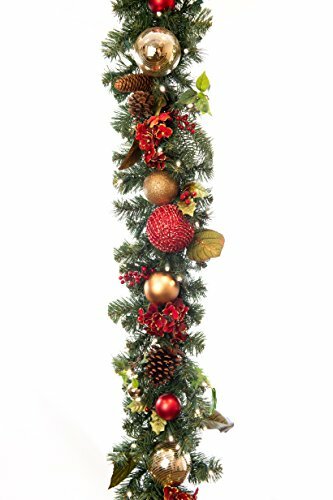 Thick, artificial PE and PVC branches give the garland a stunning life-like feel. Permanently affixed shatterproof red and gold UV-resistant décor insure the wreath will look new, year after year. The battery-powered lights will last up to 30 days, on "timer" mode, with four D-size batteries (not included).